« Three graves, two countries, one war, one hundred years on. This is a sequel to my previous post, relating my visit to the graves of my relatives killed in WWI. I had initially hoped that I might have time on that trip to include a visit to the Glade of the Armistice near Compiègne, but in the end I had to give it a miss as my schedule didn’t allow it. However, an unexpected short-notice return to France as part of an official visit to our twin town of Dreux left me with enough time to call in on the way back to Calais afterwards. This is an account of that visit, and some more general musings on war itself. The weather in France is grey and rather damp, just like the last time. Heading back to the Channel from Dreux, I take a slight detour at Compiègne to visit the Clairière de l’Armistice, or Glade of the Armistice in English, where the Armistice of 11 November 1918 that ended the Great War was signed. Technically, an armistice isn’t a peace treaty, it’s simply an agreement to temporarily stop fighting. The armistice of 1918 had to be extended three times until the Treaty of Versailles was signed in 1919, which did formally end the war and re-establish peace. But the armistice, rather than the Treaty, is generally regarded as the end of the war. 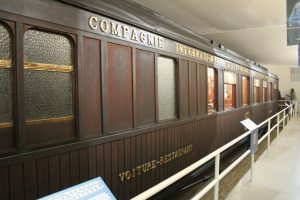 The armistice was signed in a carriage forming part of Allied supreme commander Marshall Ferdinand Foch’s private train. 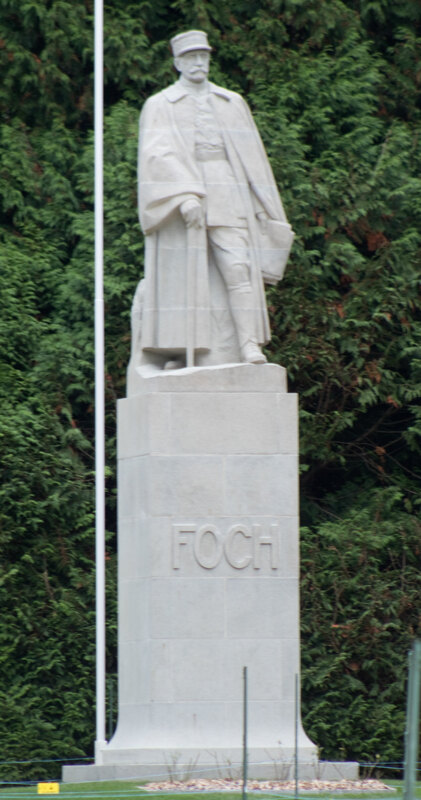 Foch had chosen to hold the armistice talks in a clearing deep in the forest near Compiègne, partly because it was easily accessible by rail and partly for the privacy it afforded. 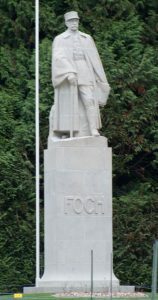 Foch didn’t want journalists present, and was also concerned that the German delegation would be attacked by angry locals if they were seen in public. 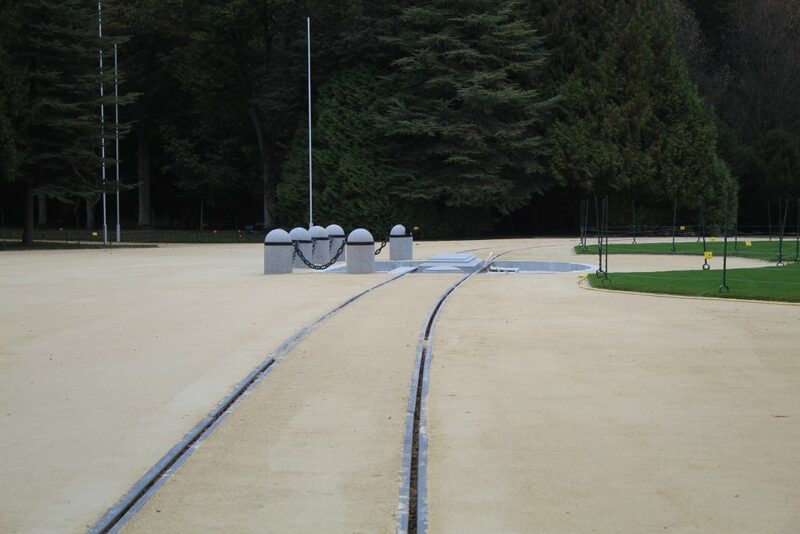 Nine years after the armistice, the carriage where it was signed was returned to the forest as part of a newly constructed memorial, now known as the Glade of the Armistice. The carriage was housed in a specially constructed building just outside the Glade. The actual location of the signature is marked by a plinth. Annoyingly, I discover that the central part of the Glade itself is closed to visitors, presumably to allow for work in preparation for the major events that will take place here in November. But the museum is open, so I pay my €5 and go inside. The museum is certainly interesting, and I’d recommend a visit to anyone if you have the opportunity. But, while informative, I do feel something of a lack of any real historic connection to the events of 1918. The carriage in the current museum is not the original. It is a genuine, identical carriage from the same train, but it’s not the one where the armistice was signed. Equally, the museum is not the original building. In fact, there’s only one part of the original memorial, constructed in 1927, which remains. And I can’t get close to that as it’s inside the fenced off section. But the reasons for that are, possibly, even more telling. The armistice wasn’t officially a surrender by the Germans, but it might as well have been. The conditions imposed by the Allies on the defeated Central Powers, and Germany in particular, were sweeping and punitive. At the time, that made sense. Germany was the aggressor, and had been defeated. The Allies wanted to ensure that Germany not only suffered for their behaviour, but were in no position to be a threat again. The demilitarisation of Germany, and the destruction of German military hardware and infrastructure, was a justifiable and proportionate response. At least, that’s how it looked in 1918. Leaving the museum, I find that I can actually get into the central part of the Glade via a hole in the hedge. I don’t go too far in, because I don’t want to get spotted and told off, but I do manage to get a few photos. Some parts of the memorial are protected by electric fencing, although I presume that’s aimed more at animals than cheeky intruders like myself. Of course, with the benefit of hindsight we know that German demilitarisation didn’t last. Nor did the peace brought by the armistice. Only thirteen years after being constructed, and only 22 after the armistice was signed, the Glade constructed as a memorial to French military triumph became the scene of French military humiliation. On 22 June 1940, German troops smashed the walls of the museum in order to roll the carriage back onto the precise spot where the armistice of 1918 had been signed, and the leaders of France, in the presence of Hitler, were forced to sign their own surrender at the very same desk. The Germans then destroyed the entire site, with the exception of the statute of Marshall Foch which was deliberately left overlooking a wasteland. The carriage was taken to Berlin. It, too, was later destroyed in the final days of the Second World War. Which is why everything at the Glade now, with the exception of Foch’s statue, is a reconstruction, a replacement or a new addition. Leaving the Glade, and with some spare time left, I go for a walk through some of the forest. Footpaths and cycle paths have replaced the railways which brought Foch to the clearing, and the area is now a significant leisure destination. It’s a far cry from both 1918 and 1940. A visit to the Glade is instructive, though, particularly when comparing the two wars it played a central role in. The armistices it hosted were different; the first was the end of a war, the second was an early step on what the winners hoped would be a march to overall victory. But both were deliberately designed to humiliate the defeated army, and both succeeded in that aim. The second war didn’t end with an armistice like the first, though, or like the second armistice signed at the Glade. And the reasons for that are worth noting. I’m always a little uncomfortable with rose-tinted wartime nostalgia. There’s a kind of “Goodnight Sweetheart” folksiness about a lot of our cultural memories, which tends to play down the darker side. There’s a subtext to many wartime re-enactments, such as those popular on heritage railways, which gives the impression that that was somehow a better, purer time – reinforced, sometimes, by a belief that the modern world has lost its way. I appreciate that the “Blitz spirit” is real, and that the camaraderie of those determined to pull together through adverse circumstances is to be celebrated. So, too, is the heroism of those who actually take part in the fighting – although we should be careful of excessively honouring those who, in reality, were merely more lucky than their comrades. But we need to be careful not to airbrush the realities of war. I find “Dads Army” as funny as everyone else, but in reality the characters in that show would all have had family and friends out on the battlefield being killed or crippled. Finding humour in tragedy should not be allowed to minimise the tragedy. I’m not a pacifist. I believe that war is sometimes justified and necessary. But it’s necessary in the same way that chemotherapy, or open heart surgery, is necessary. Not because it is a desirable goal in itself, but because the alternative is worse. But, just as a person’s condition has to be pretty serious to justify putting them on an operating table and slicing their chest open with a saw or dosing them up with drugs that can kill as easily as they can cure, so war is a last resort for dealing with an otherwise intractable problem that, if left unaddressed, will only cause more harm. Even when it is justified, war is still a terrible thing. War kills people. War tears families apart. War devastates communities. War destroys infrastructure. War always leaves everybody – including the victors – worse off than they were when they started. But that is something that we – thankfully – learned as a result of the two World wars. It’s now generally accepted that one of the root causes of WWII was the harsh and unfair treatment meted out to Germany at the end of WWI. Far from preventing another war, the armistice agreement stoked up resentment and paved the way for a populist leader to plunge the word into an even greater conflict. The Second World War ended differently. Although, militarily, Germany’s defeat was far more comprehensive, being invaded and occupied by the Allies, the aftermath followed a different course. Instead of humiliating Germany, the primary aim of the Allies was to rebuild it as a modern, democratic state. Looking back at the post-war history of Europe, it has to be said that the plan worked. Although there have been smaller, more limited conflicts on the continent, there has never been anything like a full-scale war. Even elsewhere in the world, although there have been many local and regional conflicts, none have spilled out into the wider area. Peace is fragile, and so is democracy. There is no room for complacency. But we are heading in the right direction. The number of wartime casualties has been on a consistent downward trend since the end of WWII, even despite well-known conflicts in Korea, Vietnam, the Middle East and the Balkans. The number of wars between states has reached an all-time low. Only the persistence of civil conflicts, particularly in the Middle East and Asia, keeps the death toll ticking over. It’s unlikely we will ever eliminate war. Not least because authoritarian regimes tend to generate internal opposition, and it’s easier now than it ever was for opposition to be armed. While the amount and deadliness of major international conflicts has decreased, the number of small, limited internal conflicts has risen. Governments are less likely to take up arms to attack another country, but more likely to take up arms to repress their own people. And, when they do, their people are more likely to take up arms and fight back. The challenge for anti-war campaigners has, therefore, also shifted ground. Where the focus was once on persuading states not to attack each other, the priority now has to be on preventing internal conflicts. And, in practice, that has to mean supporting the spread of democracy and human rights. By far and away the largest numbers of military casualties now occur in civil wars in totalitarian and authoritarian states. Those of us who are fortunate enough not to suffer from them have a responsibility to stand up for the benefits of democracy and the basic rights of all humanity to live in freedom. The legacy of 1918 demands nothing less. One of the key features of the rebuilt Glade of the Armistice is the Peace Ring. 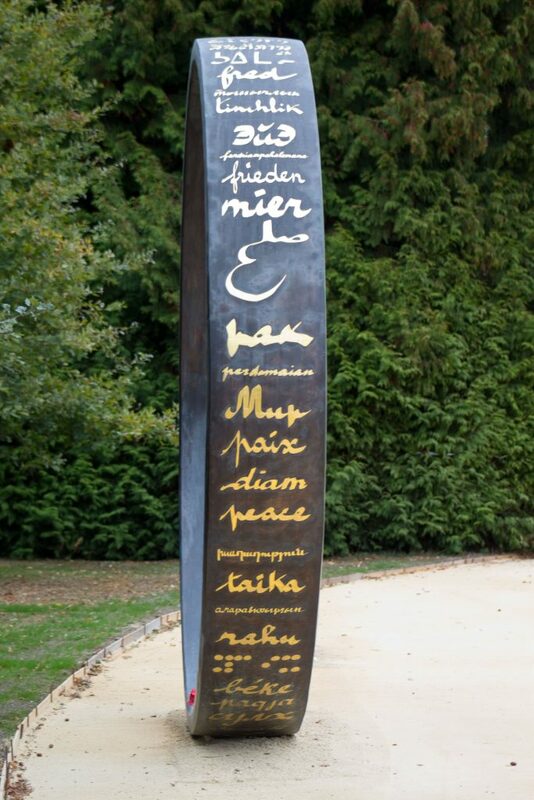 This is a bronze ring, 3.5m in diameter, bearing the word “Peace” in 52 different languages. Where the Glade was once a memorial to military triumph and humiliation, it now stands as a vision for the ending of all war. Sneaking through the hole in the hedge, it’s the only one of the monuments within the clearing that I’m actually able to get close to. It’s a good way to end my visit to the Glade. And a good message to take home with me.